Bono was born Paul David Hewson in Ballymun, Dublin on May 10th 1960, a second son to Bobby and Iris, and a younger brother to Norman. The family lived at number 10 Cedarwood Road in Ballymun which is in North Dublin. 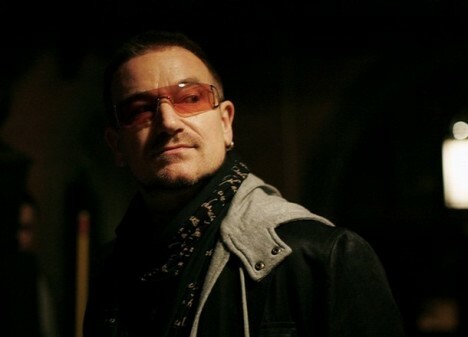 With a Protestant mother and Catholic father, Bono grew up with a strong religious faith but avoided becoming attached to one particular denomination. His mother died in 1974 (within days of the death of her own father) when Bono was just 14 years old, an event that was to have a strong influence on his later songwriting. Losing his mother at such a young age was something that he had in common with Larry, which led to a particularly close bond between the two, especially in the early days of the band. He joined a group of kids who called themselves Lypton Village, and it was there that he acquired the name Bono Vox. The members of the group would give each other names that they felt reflected who they were better than their given names. The origin of Bono’s name has been variously attributed to a dog food, a brand of hearing aid, and the Latin phrase for ‘good voice’. The hearing-aid explanation seems to be the most widely accepted. There was a shop in the O’Connell Street area of “Dublin” which sold ‘Bonavox’ hearing aids, and this seems to have been adapted to Bono Vox. In the early days of the band, Bono was the dominant force, playing guitar, singing, and writing the songs. As Edge became a better guitarist however, Bono was restricted to vocals only. Even then, there was a time when the others considered removing him from the band altogether, as it was felt that his voice wasn’t up to scratch. Fortunately for all concerned, he remained. Bono has always had a great stage presence. Even at school, where he was the first person to embrace punk, he had a flare for grabbing people’s attention. From the beginning, he was a natural at working an audience and getting the best from them by interacting with them. This has been a constant feature of U2’s live shows right up to the present day, perhaps most notably during the ZooTV tour, when he took on the guise of characters such as ‘The Fly’ and Mr. Macphisto. Bono was awarded the 1999 MTV Free Your Mind award for his charitable work, particularly with the Jubilee 2000 campaign. He has also been heavily involved with NetAid and Warchild, to whom the profits of the ‘Miss Sarajevo’ single go. These are the latest in a series of worthy causes that have been championed by Bono. U2 have always been serious about their politics, Bono especially. There has been disagreement at times within the band about Bono’s use of the stage to preach politics to the audience at a live show. Edge in particular is uncomfortable with the idea of lecturing fans, taking the view that there is a time and a place for political debate, but onstage during a show is not it. In June 2001 however, Bono literally did deliver a lecture when he gave the Class Day Address at Harvard. Bono already had connections with the prestigious university through Professor Jeffrey Sachs, the chief economist for the Jubilee 2000 campaign. The Elevation tour happened to be in Boston during Harvard graduation week so Sachs arranged for Bono to be invited to speak at Class Day. I was fortunate enough to attend the speech in person thanks to my good friends Perry and Win. Since the end of the Elevation tour in December 2001, Bono has continued to be actively involved in campaigning for debt relief in Africa. He visited Ghana, South Africa, Uganda and Ethiopia with US Treasury Secretary Paul O’Neill in May 2002 and has continued to work with DATA (Debt, AIDS and Trade in Africa) with the support of several world leaders and financial backing from the Bill and Melinda Gates Foundation. U2's twelfth studio album, No Line On The Horizon was released on 27th February 2009. Much of the recording for this release was done in Fez in Morocco, which was supposed to result in quite an "experimental" sound. In the end this sound was not as evident as fans might have hoped and the album didn't sell as well as its predecessors. Having said that, a lot of fans felt that the album was more of a "grower" and would go on to be seen as a great U2 record. The band ran into some controversy when it was claimed (in Parliament, no less) that the BBC were wasting licence payers' money helping them to promote the new album. They were featured on multiple TV and radio shows and even performed a short set from the roof of Broadcasting House in London, which some observers claimed was the kind of publicity money couldn't buy. The first leg of the U2360 tour began in the Nou Camp stadium in Barcelona in June 2009 and finished in the Milennium Stadium in Cardiff on 22nd August. The band then had a short break before the next leg in the United States, beginning in Chicago on 12th September. Further legs through Australia, New Zealand, South Africa, South America and North America followed It was initially thought that the band would release another new album, possibly in early 2010 if not in late 2009 after Larry's drum tech, Sam O'Sullivan, had been quoted as saying that there would be a new release called Songs of Ascent. Surprise, surprise, that didn't happen and the band have now been quoted as saying that they're taking a break from touring, so it's unlikely they'll be on the road again for at least the next 2 or 3 years. Bono told fans in 2001 that U2 had a lot of new material and would have another album out very soon. In the end it took 4 more years! It's been announced that an official book chronicling the tour will be released in October 2012. 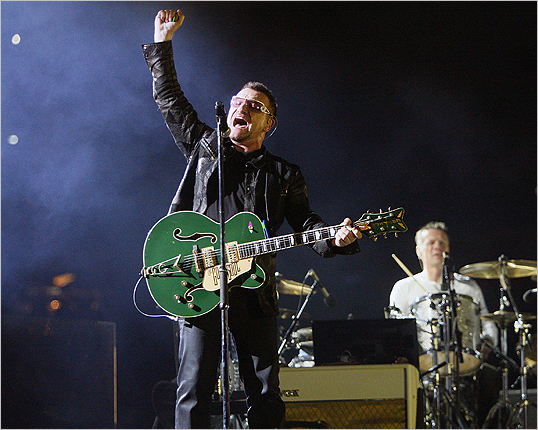 It will be modestly titled, "U2360: The Official Story of the Greatest Spectacle in Stadium Rock History". Bono is married Alison Stewart in 1982, and they have 4 children, daughters Jordan (born May 1989) and Memphis Eve (born July 1991) and son Elijah Patricius Q Guggi (born August 1999) and John Abraham (born May 2001). The latest one was famously described by Bono as “looking like a thug” when he was born. On 21st August 2001 Bono lost his father after a long battle against cancer. Like the rest of the band Bono still lives in Dublin, in the exclusive suburb of Killiney.